Their businesses took different paths from the start. Gathering Together Farm (GTF) grew to be a mid-sized vegetable operation of about 50 acres, with all products sold locally. The Mortons' Shoulder to Shoulder Farm specialized in salad mix that they sold to numerous high-end restaurants across the United States. Frank and Karen also grew their own seed and selected for better salad varieties, and in 1994 started selling their varieties to farmers and seed companies through their Wild Garden Seed catalog. They stopped selling salad mix in 2001 to focus all their energy on seeds. Frank recalls that as the seed business started to take off, John and Sally offered them land at GTF if they needed more space for seed crops. 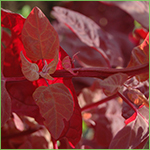 The Mortons accepted the offer, and together they grew their first crop of red orach seed. "The problem was, we didn't know how to clean it, and I finally found one place that said they could do it," Frank recalls. "They had never processed orach seed, and they just destroyed it. I watched 200 pounds of seed go up, literally, in dust. Well, I was anxious what John's response would be. But when I called him up and told him what had happened, he burst out laughing and said, 'We'll have to try that again.' That was how I knew we had found the perfect partner. We have destroyed many crops together since." Frank jokes about what he calls their early "misadventures," but in fact, the collaboration between Gathering Together Farm and Wild Garden Seed has been a great fit for both. "The integration makes both businesses more significant than either would be on its own. We are the only farm operation I know of that handles vegetable species from seedhead to table via an on-farm restaurant, including seed variety development. That is a very long chain of stewardship, and it is a wonder that we can pull it off," Frank says. The two farms merged in 2002, with GTF technically buying Wild Garden Seed and contracting with the Mortons to coordinate seed production within the overall farm system, and manage the harvest, cleaning, and marketing of seed crops. The geography of the farm benefits the seed business, because its fields are small parcels, 1 to 5 acres in size, spread along nearly two miles of the Mary's River. That provides the isolation distances needed for breeding and seed production. Even so, integrating seed crops into the farm system in such a way that provides both isolation and crop rotations is a complex matter. 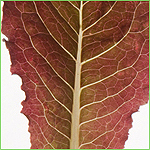 Biennial crops such as brassicas, beets, and chard are grown by GTF for harvest. At the end of the season, instead of plowing them down, they are turned over to the care of the seed growers, who choose which plants they will let go to seed the following season. "If we had to grow all that produce without selling it, that would be a huge expense for us," Frank says. "Because we're growing them for harvest, we can watch how the plants grow and make selections based on their value as food crops." Besides the biennial crops, about 4 acres of annual seed crops are grown at GTF. Those are not harvested for produce but are managed only for seed production. Frank and Karen also grow some seed crops at their own farm and at another employee's farm, for a total of 12 acres of seed production. 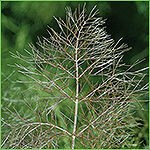 Besides selling seed through its own catalog, Wild Garden Seed has also become a supplier of organic seed to numerous other seed companies, including Johnny's Selected Seeds. Frank recalls that his association with Johnny's goes back to 1999, when founder Rob Johnston, Jr. visited Shoulder to Shoulder Farm and commented on several unusual varieties in the gardens. "There was a lettuce I had been working on for a couple of years that I called 'Outredgeous' because it was the reddest lettuce I had ever seen at that time," Frank says. "Rob didn't say anything then, but when he got back to Maine he called and asked if he could give it to a contract grower in California to produce at a volume I could never produce." Frank said yes, and 'Outredgeous' was introduced in the Johnny's catalog a few years later, and has been offered continuously since. Over the years, Johnny's has sold many other varieties developed at Shoulder to Shoulder Farm, including 'Flashback' calendula, 'Bronze' fennel, and 'Persian' cress. One of the primary benefits of the collaboration between Wild Garden Seed and Gathering Together Farm is the production expertise GTF's farm crew brings to the operation. Having high-quality crops at hand makes it much easier for the seed crew to select the most vigorous and productive plants for seed saving. 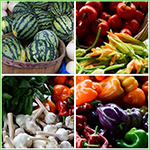 In turn, the vegetable operation benefits from growing varieties that have been selected for their success on that particular farm — crops grown from Wild Garden Seed are better adapted every year. Salad mix is one of the signature crops at GTF, and all the ingredients are open-pollinated selections from Wild Garden Seed. 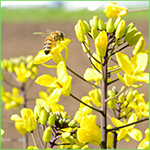 Not all GTF crops are open-pollinated, however; many hybrids are included among the more than 300 varieties of the 50-plus types of vegetables grown there. 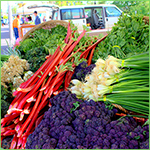 Since the beginning, farmers' markets have been the top distribution channel for GTF produce. 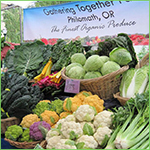 They sell at 12 farmers' markets in metro Portland, Corvallis, and Newport, Oregon, including several year-round markets. Their market stands are renowned for their diversity, abundance, and sheer beauty. "John Eveland is a master of presentation," Frank says. "He knows how to extract twenty-dollar bills from people by the way he presents food." John actually came from a restaurant background before he started farming, and he returned to it in 2003 by opening a restaurant on the farm. The Farm Stand serves lunch Tuesday through Friday, dinner on Thursday and Friday, and Saturday breakfast. Four times each summer, the farm puts on a popular wine dinner, showcasing local wines and locally grown food. The Farm Stand also has a shop with products from GTF and neighboring farms. It's known far and wide for its organic potato doughnuts, made from scratch each morning. 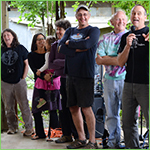 Gathering Together Farm has also run a Community-Supported Agriculture (CSA) program since 1996. This year the CSA sold out in April, with 320 shareholders for the 22-week season. Additionally, the farm sells to restaurants in Portland and Corvallis. Chefs can sign up for a weekly email listing of availability, and choose to have it delivered or to pick it up themselves at a farmers' market. Of course, all that production requires many hands. At the height of summer, GTF may have as many as 80 people working on the farm. To keep all those workers happy and productive, John and Sally offer a hot "Farm Lunch" three days a week. A farm cook prepares a meal that usually consists of a hot dish, salad, and baked goods. Everyone on the farm — field crew, seed crew, office staff, packing shed staff, owners and visitors — gathers to enjoy a meal made primarily from the food they have grown. Farm Lunch started more than 20 years ago, and although it has become an expensive proposition with today's large staff, the farm owners believe it is worth the cost. The rich diversity of activities at Gathering Together Farm doesn't end at the farm gate. Both the Eveland–Brewer family, with their three daughters, and the Mortons, with their two sons, are active in their local communities. They contribute food to charitable events, host on-farm parties and field days, train interns from the nearby university, and much more. "Our goal as farm-based seedspeople is to make our farms function better by the added crops and biodiversity that seed growing and selection bring, and to share our work in breeding, crop improvement, and agroecology with other farmers like ourselves. Seed saving and adaptive selection have been part of the farmer's rights and responsibilities since the emergence of agriculture. As practitioners of this old art, organic farmers can reclaim the power to forge crops that better fit their land, their systems, and their imaginations. Gathering Together Farm and Wild Garden Seed are working with farmers, researchers, and other seed companies to co-create an organic seed system that provides quality seed, varietal diversity, and superior genetics." 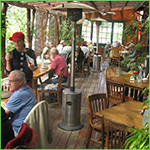 See examples of The Farm Stand Restaurant Menus. See photos of the weekly CSA Boxes. Read a blog post about Farm Lunch. Images reproduced with permission from Gathering Together Farm. All rights reserved.